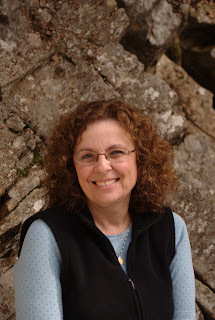 Today we have the adventurous and awesome Ms. Gina Rosati! Gina lives in southern New Hampshire with her husband, two teenagers and two chubby guinea pigs. Auracle is her debut novel. Besides read (everything!) and write (as often as possible) I highly recommend you buy, read and highlight the heck out of Story Engineering by Larry Brooks http://www.amazon.com/Story-Engineering-Larry-Brooks/dp/1582979987 You might not be an outline kind of writer, but there's a lot of great info in there you need to know. I love The Little Prince by Antoine de Saint-Exupery so much, I referred to it in Auracle. I love it because of the fennec fox and his secret ... so very true! Where did you get the idea for Auracle? For about ten years, off and on, I'd get really scary bouts of sleep paralysis, which included lucid nightmares. I've read a lot of conflicting information about them, including that they are caused by stress (highly likely in my case) or they are caused by waking up during an out-of-body experience while you are still half out of your body (which is less likely in my case, but infinitely more fascinating and I thought it would make a good book). Although I still think my dreams were stress induced. Did you hit any snags while writing Auracle? What were they and how did you fix them? When I started writing Auracle, I didn't understand the importance of story structure. I had the basic "what if a girl could astrally project and witnessed a death, and the dead person took over her body," and that was about it. I sat down at the computer based on that idea and started typing and when I got stuck, I added a kissing scene.Sooo many kissing scenes! I managed to bang out a 300+ page manuscript, and I sent it out to friends who love me and told me it was good stuff, so I queried agents with the first chapter. I guess my early writing voice was decent because I had a few requests to see more of the manuscript. Andrea Somberg from Harvey Klinger, Inc. made some excellent suggestions about plot, character, theme, story structure, etc., and invited me to resubmit it once I rewrote the last 2/3 of the book. Andrea signed me about four months later. Which one of the characters in Auracle is your favorite and why? Rei. A few people have commented that they think he's too perfect because he's good looking, smart and a nice guy, but if you look closer, you'll see the people pleasing, obsessive/compulsive personality at work. He's actually a complicated guy who was a lot of fun to write. I didn't want to be an author when I was a kid - I wanted to be an elementary school teacher. It wasn't until I was in my mid-late 20's that I thought it would be fun to write a book. The entire writing/publishing process seemed very daunting to me, but one day, I walked into a library and figured if all those people could write a book and get it published, why couldn't I? I took a creative writing course at Northeastern University, and the teacher was really encouraging. She asked if she could enter a short story I wrote in the university writing contest, and it was chosen as a finalist. Writing a novel is very different than writing a short story, and even though I had an idea for a novel, and I had a 60 page outline, I suffered from what I call "Perfect Page 1 Syndrome" - I thought I had to get that first page just right before I could move on to the next page. I spent six months trying to perfect the beginning of that book, and when I had my son, it was just easier to pack my writing away and concentrate on being a mother. It wasn't until my own mother was in last stage Alzheimer's that I decided life was short and if I truly wanted to write a book, now was the time. Auracle is a stand-alone novel. I may consider a companion novel at some point told from Callie's POV (with Seth, Anna and Rei all featuring into the story) but right now, I'm working on a historical/fantasy/speculative fiction. What's it like trying to write about someone who astrally projects? Did you do research for that or just sort of make things up as you went? Writing about someone who can astrally project is really fun - the question became "where would I go if I could go anywhere in the universe?" My biggest problem was not giving Anna a broader area to explore, but the plot centered around the situation in Burlington, so that limited Anna. I did a tremendous amount of research, I spoke to people who told me they have traveled astrally before, I read a lot of books about the subject, but at the end of the day, I did make up a great deal, too. So, you got a tattoo as research for this book. Can we ask what it and the others are, or are those personal? Sure - the first tattoo I had done is three shooting stars, all in black/outline. I was really hesitant to have anything that would show, so these are between my shoulder blades. Then I grew a little braver and had really colorful shooting stars done on my right calf, just above my ankle. 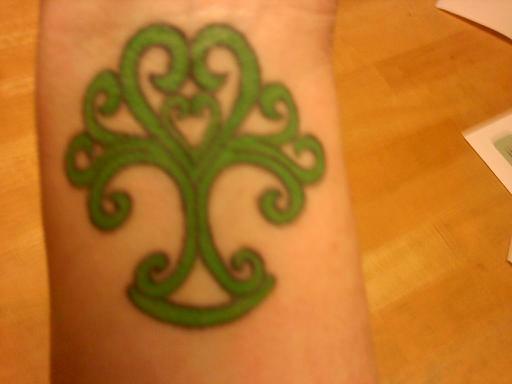 Then I grew braver still, and had a bright green celtic tree done on the inside of my right wrist. If all the cuddly animals that you love so much were to get together in one room, which would you pet first? Oh!! 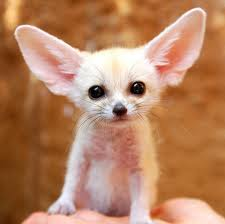 The fennec baby, for sure! And the puppies! And then the kitties! And the bunnies! And the guinea pigs! Wait ... are there raccoon babies? Those too! I'd even pat the tarantula ... they're fuzzy. We know you ditched the sugary soda and now you're all about diet soda. What's your flavor of choice? Coke vs. Pepsi? Or something more exotic? I have to give up the diet soda, too - it's really unhealthy! I bounce around. I used to drink 32 oz. of full sugar Coke in the red can a day, but when I gave that up, I lost 20 pounds in a year and kept it off (it's been 3 years now). Right now, I drink Dr. Pepper Ten (which has ten calories and a small amount of HF corn syrup) during the day and Caffeine Free Diet Pepsi at night. I try to balance it out with plenty of water in between. Gina is giving away one signed edition of Auracle and two swag bags! 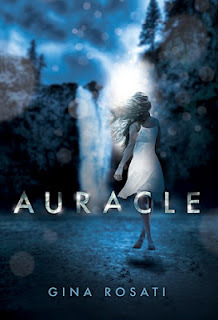 Auracle: 16 year old Anna Rogan has a secret she's only shared with her best friend, Rei; she can astrally project out of her body, allowing her spirit to explore the world and the far reaches of the universe. When there's a fatal accident and her classmate Taylor takes over Anna's body, what was an exhilarating distraction from her repressive home life threatens to become a permanent state. Faced with a future trapped in another dimension, Anna turns to Rei for help. Now the two of them must find a way to get Anna back into her body and stop Taylor from accusing an innocent friend of murder. Together Anna and Rei form a plan but it doesn't take into account the deeper feelings that are beginning to grow between them. Enter the giveaway using Rafflecopter. Hit the green "Do It" buttons, follow the prompts, and hit the green enter buttons when you're done. (You may have to log in using Facebook to do this). There will be one winner (selected by Rafflecopter). I will contact the winner via email. This contest is open to international entrants. naturally I spelled my twitter handle wrong and hit enter really fast instead of backspace. *ashamed* it's actually @bookworminlove instead of @bookworminloce. Sorry!! !